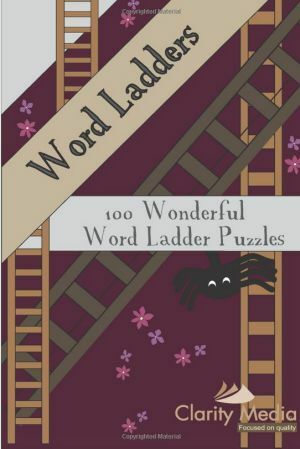 Welcome to this fantastic collection of 100 word ladder puzzles. Word ladders are fun and entertaining word puzzles that are a real test of your vocabulary. Word ladders are a simple puzzle type, but great fun. They have a long history and are said to have been invented by Lewis Carroll, who loved word and logic puzzles, as can be seen in books such as Alice in Wonderland. What is the best technique for solving a word ladder puzzle? There seem to be two schools of people: those who prefer to work from the bottom up, and those who prefer to work from the top down. Personally I find that sometimes one approach works better, and sometimes the other - it really does depend on the words and just how quickly you happen to 'see' certain links. Occasionally you might make one move at the top and another at the bottom, then try to join them up. Often you will come up against dead ends - you'll seem to make good progress only to get scuppered with a couple of words to place and no way to join them - don't worry, just try a different approach! Clearly having a good vocabulary is important, but many times all the words that you come across are very common, and the puzzle is more about working out how to move from one word to another than ever expecting you to know really strange words, so all the puzzles in this book are standard and you won't need special scrabble-type vocabulary to solve any of them! One important tip is to look at whether the pattern of consonants and vowels shifts in the word from the start to the end. This is important because it is often easy to swap a vowel for a vowel or a consonant for a consonant, but less easy to make a switch from the one type to the other. Therefore working out if you need to do this, and if you do, then working out words that will allow this to happen, can help you with the solve process. 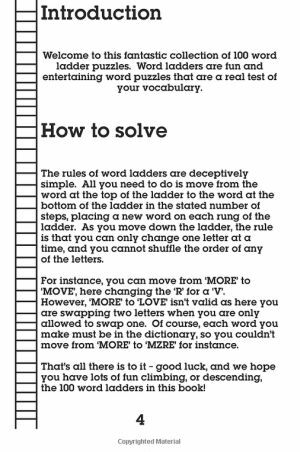 Unlike many types of puzzles, there is often more than one solution to a word ladder, due to the simplicity of the puzzle and rules and the huge number of words in English. So you may well come up with a different answer to the suggested one at the back of the book. Some players of word ladders who really love the puzzle have even been known to try and find as many solutions to each puzzle as they can - which is real dedication - but for most the enjoyment comes with simply trying to find one solution, which can itself be tricky on occasion!